“To focus on the essentials while being able to cope with all needs, without losing sight of the costs.” This might be the motto used during the development of the stock screener platform StockMonitor. 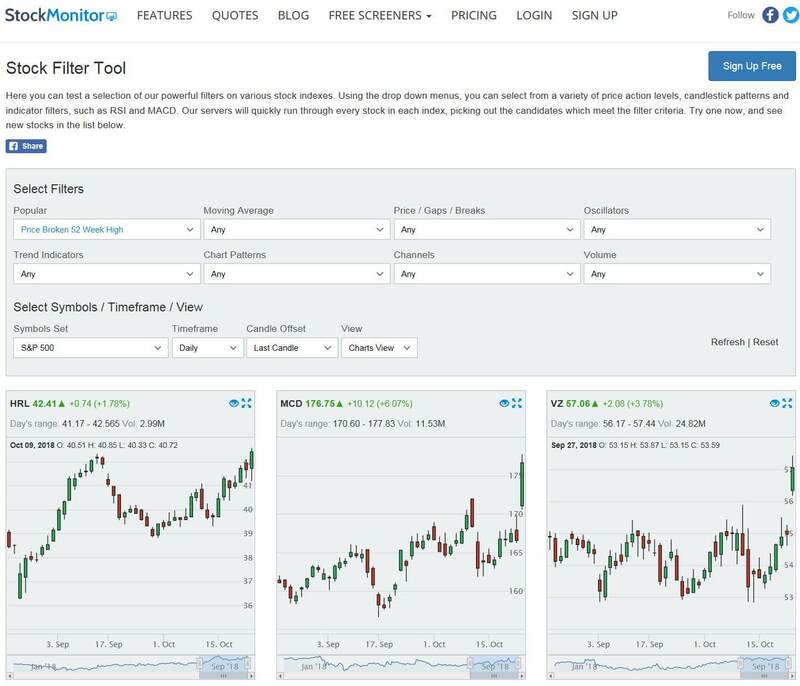 Today we will take a closer look at the functionality and the possible filters that investors and traders may use in this StockMonitor review. We also take a closer look at the price-performance ratio? Full Membership at US$ 14.99! ​StockMonitor, based in the Greater London area, has developed its platform to provide investors, traders, and day-traders with inexpensive but powerful tools. The objective is to provide up-to-the-minute knowledge of the markets to increase confidence in investments and trading decisions. There should be tools for thousands of stocks to quickly find interesting stocks each day for one‘s watchlist or self-created portfolios. To this aim, the servers have been optimized again and again. As a result, according to StockMonitor, backtesting can be done in less than a minute with an amazing amount of data. Also, to stay cost-effective with real-time data service, and without having to pass on the high usage charges of the leading exchanges to customers, they were integrated into the IEX exchange. The data does not come directly from the main exchanges, like NYSE, Nasdaq, or others – but the same companies are listed for trading on the IEX. This allows real-time feeds to be offered to short-term traders at no extra cost. 3-column charts for said major US indices. The large selection of volume indicators is a very cool feature. 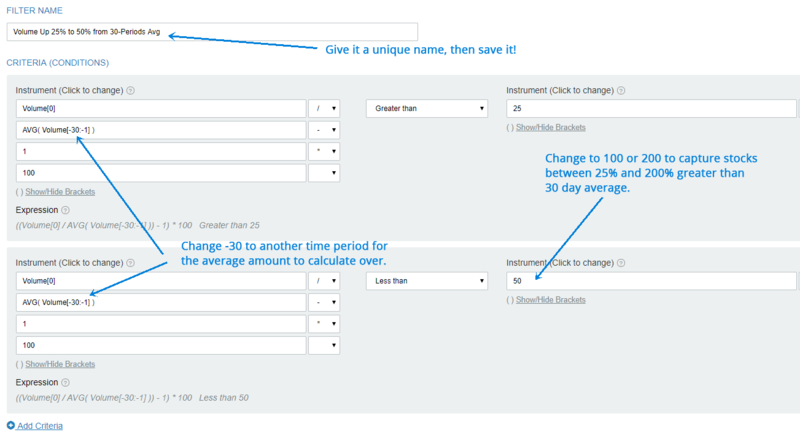 On the other hand, the filtering options are minimal concerning fundamental key figures. At least compared to ​FinViz, StockRover and Finbox.io. In the pre-selection, only these three are found: market capitalization (market cap), the price-earnings ratio (P / E ratio). Ratio) and earnings per share (EPS), which can be adjusted with a slider. The chart menu is especially useful. Every single value (stock, ETF, index, etc.) may be called up, and the chart representation can be varied (candles, line, OHLC) and adjusted. A large number of indicators, patterns and filters may be applied to it. Besides this, users can try the drawing tool and add horizontal trend lines and Fibonacci retracements. The StockMonitor blog is another highlight. Here, suggestions are given on specific questions and needs of investors and traders, like which filters to use to find attractive stocks for the current day trading. 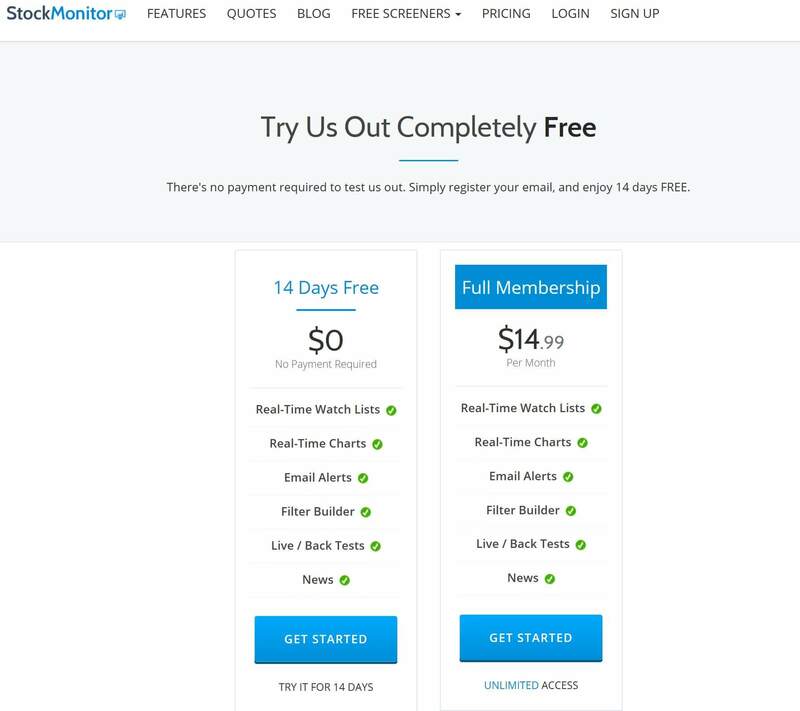 StockMonitor is moderate when it comes to the pricing: First, a 14 days free trial offer can be used - without any signup traps! There is no automatic extension with charges. 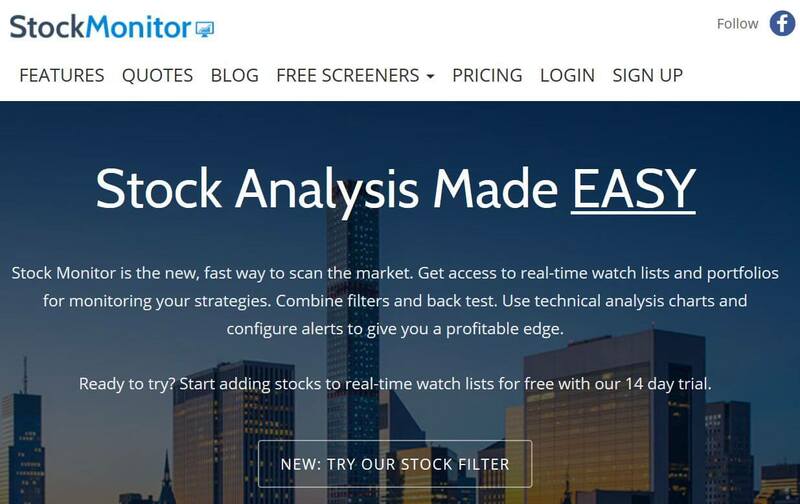 For this, StockMonitor charges just under half of the monthly fee, compared to other equity screeners such as Finbox.io or FinViz.com, at US$ 14.99 a month. After subscription, all StockMonitor services will continue to be included indefinitely. You can pay by credit card, debit card or through a regular PayPal account. This is done by standing order for 30 days in advance, which can be canceled at any time within Paypal. If the payment is canceled, StockMonitor automatically restricts the scope of services. However, StockMonitor emphasizes that the custom settings made will be saved in the case that customers want to re-join „full membership“ after a payment disruption. To state it outright: ​The monthly subscription price of $14.99 for the ​StockMonitor stock screener ​is one of the cheapest ​available. Also, a fantastic range of services is included mainly for screening for technical indicators. The offer is also on a par with other features such as the creation of own watchlists, portfolios, filters, backtests and strategies. The overall picture is somewhat clouded by the reduced filter options for fundamental key performance indicators. Given the provided real-time data (US, Canada, UK) and news, StockMonitor has definitely a reasonable price-performance ratio. Stock Monitor is ideally suited for the elemental analysis of equities. Day traders will appreciate real-time stock scanners like Trade Ideas because they stream real-time data directly from NYSE and NASDAQ. And traders can configure the Trade-Ideas scanners with hundreds of different variables and combinations, including artificial intelligence based scans.